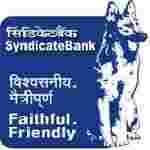 Syndicate Bank recruitment 2018 notification has been released on official website www.syndicatebank.in for the recruitment of 500 (five hundred) vacancies for Probationary Officer. Job seekers should apply from 02nd January 2018 and before 17th January 2018. Age Limit: The age of candidate should be between 20 to 28 years as on 01.10.2017.
a person of Indian origin who has migrated from Pakistan, Burma, Sri Lanka, East African Countries of Kenya, Uganda, the United Republic of Tanzania (formerly Tanganyika and Zanzibar), Zambia, Malawi, Zaire, Ethiopia and Vietnam with the intention of permanently settling in India. Provided that a candidate belonging to categories (ii), (iii), (iv) & (v) above shall be a person in whose favour a certificate of eligibility has been issued by the Government of India. A candidate in whose case a certificate of eligibility is necessary may be admitted to the examination, interview and / or Group Discussion conducted by the Bank but on final selection, the offer of appointment may be given only after the Government of India has issued the necessary eligibility certificate to him. Fee charges: Applicants who wanted to participate for Syndicate Bank should pay the below charges through online mode using only Master/ Visa Debit or Credit cards or Internet Banking. Interested and eligible aspirants should apply online application form for Probationary Officer post on official website of Syndicate Bank www.syndicatebank.in you need to provide all valid information you may also need upload the scan copies of your documents.